Let's play 'Dress with Numbers!!!' Just like your childhood color-by-number! Every Outfit starts with #1 - a fun neutral, and barely noticeable polka dot denim. I tried these on, die...so soft and perfect! I seriously want them!!!! 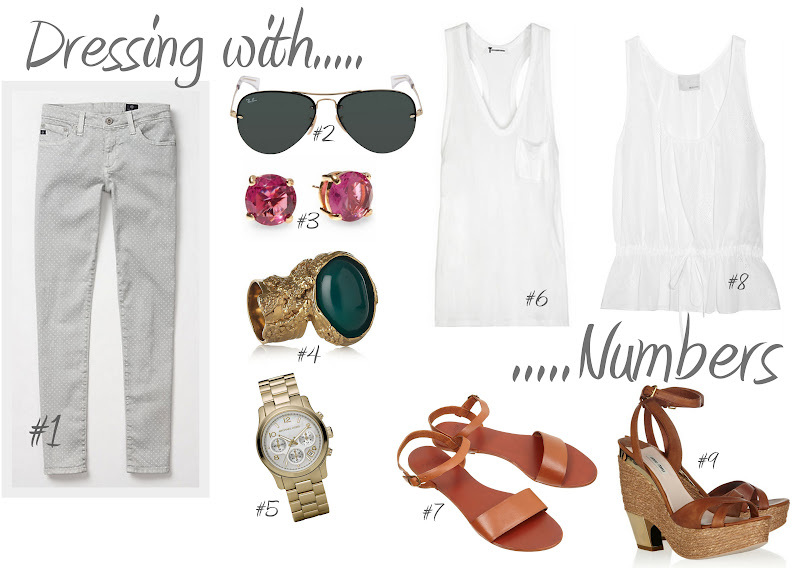 #1 + 2 + 3 + 5 + 6 + 7 = Fun day look, I'd cuff the jeans for a more relaxed look. #1 + 2 + 3 + 6 + 9 = Heels give everything a girly touch, I'm think roof top patios & concerts! #1 + 3 + 4 + 8 + 9 = Dinner date and cocktails!!! I could go on for days - classic items and staples are so easy to remix with! Let's see you play, what would your combo be??? Dress by numbers? Great idea! Okay. I have 1, 2 and 6--but I need #7 to finish it off! What a great post!Love 1+3+6+9! Oh my gosh I love this post idea! So fun and love every single piece! I am so bad at putting things together. Help me.